New York Premiere of “From Hollywood to Rose” at The Cinema Village! Home/Uncategorized/New York Premiere of “From Hollywood to Rose” at The Cinema Village! 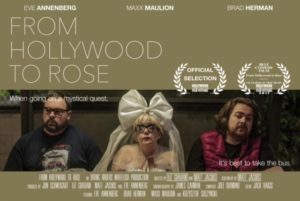 Please come to the New York Premiere of an award winning comedy I recently shot, “From Hollywood to Rose” this Saturday April 22nd at 7 pm at The Cinema Village! When embarking on a mythic quest, its best to take the bus. From Hollywood to Rose Movie Poster. By James Carman|2017-04-18T22:44:09+00:00April 18th, 2017|Uncategorized|Comments Off on New York Premiere of “From Hollywood to Rose” at The Cinema Village!